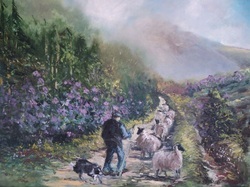 With Donegal being so scenic, it is no surprise that there are many artists producing works depciting our beautiful county. In this section we will be adding a short bio of these artists together with samples of their work. If you are a Donegal artist or an artist from elsewhere but producing works depicting Donegal and would like to have a page on our site, please use the contact form below to contact us. Click on any of the names to view a selection of their works and their website if available.